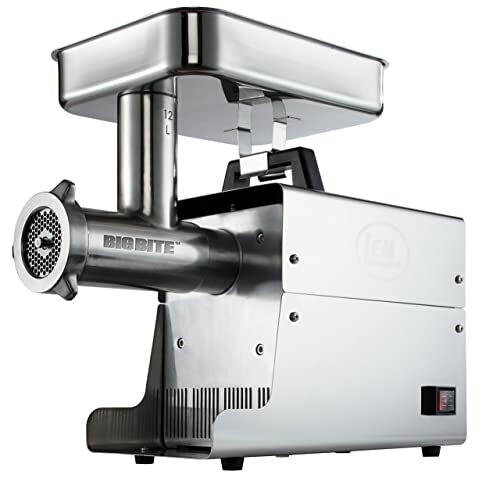 LEM Products .75 HP Stainless Steel Electric Meat Grinder is great tools for your home, if you have grind meat very often and you want something that produces great results in very little time and won’t give you mechanical problems in the future. • It just makes ground meat (no matter what type of meat you are grinding) in a jiffy. There are no problems with logging or getting stuck in the middle of grinding with this machine. Even bones go through with zero issues. Customers suggest this to homeowners and families who enjoy making sausages and ground meat. • Big Bite technology and square metal compartment for the meat that will allow customers to put more meat than average. This saves you more time. • Boasts of permanently lubricated motor, making this meat grinder one of the best low-maintenance meat grinders out there. • Runs on less horsepower so more savings for you. • Grinds meat as fast as a commercial-grade meat grinder. • It is made from stainless steel construction. • Smooth-rolling bearings for quite movements. • Has a built-in circuit breaker. • Comes with 5 years warranty. • One of the priciest electric grinders out there. Though more expensive, it is an electric meat grinder worth investing on. The grinding mechanism is flawless and can work for various types of meat. Whether for commercial or domestic use, this electric grinder will not disappoint.